A technology that can "hide" information in plain sight on printed images has begun to see the first commercial applications. Japanese firm Fujitsu is pushing a technology that can encode data into a picture that is invisible to the human eye but can be decoded by a mobile phone with a camera. The company believes the technology will have spin off implications for the publishing industry. "The concept is to be able to link the printed page into the digital domain," said Mike Nelson, general manager for sales operations at Fujitsu Europe. The technique stems from a 2,500-year-old practice called steganography, which saw the Greeks sending warnings of attacks on wooden tablets and then covering them in wax and tattooing messages on shaved heads that were then covered by the regrowth of hair. Fujitsu's technique works by taking advantage of the sensitivities of the human eye, which struggles to see the colour yellow. "The key is to take the yellow hue in the picture and we skew that ever so slightly to create a pattern," said Mr Nelson. "A camera is perfectly sensitive to that yellow hue but the human eye doesn't see it very well. "Any camera, even those in mobile phones, can decode it very easily." Pictures printed with the technique look perfectly normal but a camera can see the code printed into the image. The technique can currently store just 12 bytes of information - soon to rise to 24 - the equivalent amount of data in a barcode. That data could be a phone number, a message or a website link. Printed materials can then connect to the online world by storing information which tells the phone to connect the web. Almost any mobile phone can be used but a small java application must be downloaded before it can be used to decode the information. 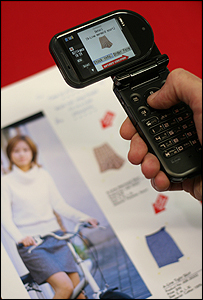 Other devices such as PDAs with a camera could also be used. Once installed the same program can be used to read other codes on other products. It takes a few seconds for the phone to decipher the data. And because most modern mobiles can connect to the net they act as a gateway to content that firms want to send to people who have decoded the steganographic pictures, such as music and video. The first commercial use of the technology is in Japan where a Music Club has embedded codes into flyers it sends to subscribers. "Through that flyer they can link through the pictures to music clips," said Mr Nelson. Any printer can be used to print the coded information inside a picture and Fujitsu is looking to license the technology to publishers. There is also a small fee for the use of the decoding software which sits on the firm's own servers. Mr Nelson believes the technology is more useful than barcodes because of its invisibility and because it connects printed matter to the internet, via the phone. "There's a lot of printed material out there today whether it be food wrappers, billboards, catalogues, phone directories and business cards and they are not going to go away. "We need an added dimension to that flat material and linking that to the digital domain is what we are trying to do." Mr Nelson does not believe steganography is competing with technologies such as RFID tags, tiny radio chips which can hold information and be scanned at a short distance. "You have to physically mount a chip into the device - it's expensive and time consuming. "Steganography can be embedded as part of the normal printing process." Mr Nelson said he believed promotions and competition would drive take up of the technology as a prize would act as an incentive to use a mobile phone and download the decoding application.